SADBLOG- The BUZZ: Google Chrome is HERE! signed make your internet experience faster and easier. Google leaked or "accidently" distributed a comic outlining the new product. You can view that here. The comic outlines the reason why Google Chrome was created. ay and not just take it. Google will battle microsoft on yet another front. sers out there. Interent Explorer holds 74% of the market with Mozilla coming in second with 18%. Should you download Google Chrome?? not hurt as it doesn't update or replace any of your current browsers. Chrome stands alone. So if you are into trying new things then give it a try! Google Chrome was released today around 3:00 pm at the link below. You are done! Happy Surfing! When you open a tab Chrome automatically lists web clip images of your favourite sites to visit! There is only one Box to type into. The box is called the "omnibar" You can type in a search or website in the same box. As you type many suggestions will pop up for you to choose. 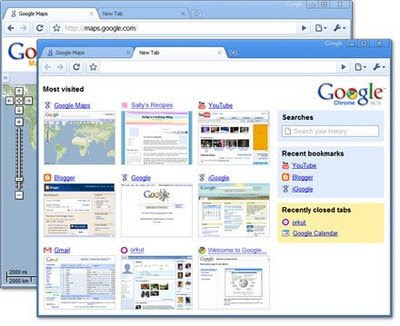 I will post a review of the new GOOGLE CHROME and I.E. 8 in the future so check back soon. Feel free to post any of your comments on this blog about the new browsers. Hey Doug! Can I ask a ? if you don't mind? I have been reading up on the Google Chrome. It looks great but what I'd like to know before downloading is...do I HAVE to have ALL of my favourites on the desktop screen or can I pick and choose? Is there a source of favourites elsewhere to store? It took me awhile but I have been playing with Chrome and I must say I really like it. You have control over what favourites or bookmarks you like. Chrome handles bookmarks in a very simple way. Bookmarks can be stored on the BOOKMARK bar (located just below the chrome controls. They can be stored on there own as buttons or in folders. One neat thing about Chrome is if you choose to browse a site on a new cell phone but forget to bookmark it, that site will still appear when you do a new search on cell phones! Part of the results will always be sites you previously browsed! I will be expanding on my Chrome review in this blog so check back soon.